We had a Dessert Auction at our church this past month as a fundraiser for our Youth Group to go to camp. The event was after our evening service. We ask people to sign up (starting 3 weeks in advance) to donate desserts, they bring them in the day/night of the auction. The sign-up helps to limit the number of desserts. Sometimes the event goes for 2 hours or longer and starts to drag. If you're thinking of doing this MAKE SURE YOU LIMIT THE NUMBER OF DESSERTS. During church we set up the tables with all the desserts displayed. Right after church everyone walks around for about 15 minutes to look at all the desserts. 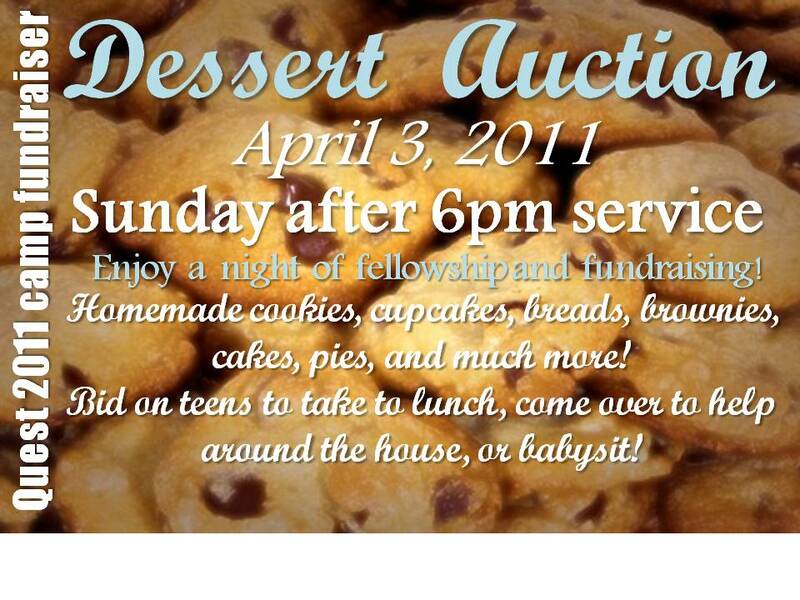 Our youth pastor (my hubby) auctions off the desserts, starting anywhere from $2-5. Most of our items go for $10-20. ($20 for cookies is A LOT!!! Especially when it is all profit!) Some of the more "famous" desserts go for close to $100 each. We also auction off the teens in groups of 2. The teens can be bought to help with house work, babysitting, cleaning, yard work, etc. Instead of the teens going out to try and raise money on their own, the amount they are "bought" for goes into their individual camp account. It was a lot of fun and we raised $1300 in one night!